Don Alphonso was not a cross between a Thoroughbred and a jackass but rather a well-bred jackass, as the term “Thorough-Bred” is used here to denote purebred. Described by his owner, Richard Bland, as being of “high perfection” and possessed of “as much vigor as any Jack I ever faw [sic]; and that I believe him to be as fure [sic] a foal getter as any on the continent.” Don Alphonso stood for six dollars for the season lasting 10 March to 10 August 1802. The summer 2011 issue of Broadside, the Library of Virginia’s quarterly magazine, is now available. Broadside describes and illustrates the holdings and happenings at the Library of Virginia. Discover fascinating items from the collections as well as events, exhibitions, educational programs, and opportunities to become more involved. The winter 2011 issue of Broadside, the Library of Virginia’s quarterly magazine, is now available. Broadside describes and illustrates the holdings and happenings at the Library of Virginia. Discover fascinating items from the collections as well as events, exhibitions, educational programs, and opportunities to become more involved. The current issue focuses on the Library’s Union or Secession: Virginians Decide exhibition. The fall 2010 issue of Broadside, the Library of Virginia’s quarterly magazine, is now available. Broadside describes and illustrates the holdings and happenings at the Library of Virginia. Discover fascinating items from the collections as well as events, exhibitions, educational programs, and opportunities to become more involved. The current issue includes articles on U.S. Census records and the Robert Alonzo Brock collection. 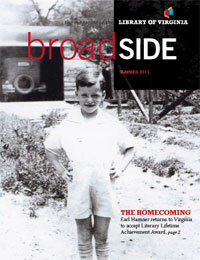 The summer 2010 issue of Broadside, the Library of Virginia’s quarterly magazine, is now available. Broadside describes and illustrates the holdings and happenings at the Library of Virginia. Discover fascinating items from the collections as well as events, exhibitions, educational programs, and opportunities to become more involved. The current issue includes articles on the papers of journalist Charley McDowell, the Library’s new Civil War Research Guide, and on how a Library of Virginia collection played a key role in the return of a World War II veteran’s Purple Heart certificate and photograph. 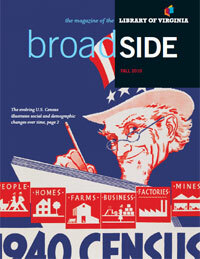 Click here to subscribe to Broadside or view past issues.